Have you ever thought of what it would have been like 150 years ago crossing into a new frontier? This trip will cover over 2000 miles and would take you five months to complete. One in ten people will not make it and will be one of the many crosses on the side of its path. You would run into wild rivers, large animals and massive mountain passes. Outside these dangers there is a promise for a new start in life, gold and opportunity. You will have to take all your life’s belongings with you, along with what you need to start your new life in the wild west. You also need necessities like food And water as the trip is long and physically demanding. You will face cold in the mountains, extreme heat in the desert and harsh winds on the plains. This will all be done with you and your family on a stagecoach along with several others seeking the same dream. Native Americans often assisted emigrant parties in their travels west. They helped as trail guides in dangerous crossings, food and medical help was provided. Emigrants brought disease and killed the wild game. Despite popular fiction, emigrants circled their wagons on their journey to corral their livestock they brought with them and not to ward off attacks from Native Americans. 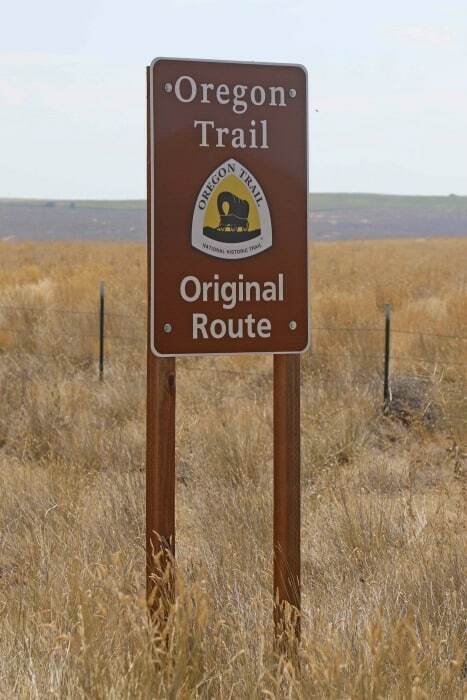 Today you can visit numerous locations along the Oregon Trail. You can walk its path and imagine what it must have felt like by the time you reached present-day Oregon! It’s been a long five months and everyone including your family and livestock is exhausted. All of your supplies have been worn from the past five months with harsh trails and weather conditions. You now need to settle into a new land and start a new home. You have completed your first journey just to turn a new leaf and begin a new life. The National Park Service , Bureau of Land Management and several other local agencies help preserve the remaining 300 miles of trail and tell of its struggles to travel west by stagecoach. The ruts are still in place from the 300,000 people who made this trip across from Missouri to Oregon. Today we are fortunate to easily access these sites from the comfort of our cars and learn of the hardships our ancestors made. I can only imagine what this one trip made on their outlook in life. The westward expansion in the United States has always been one of my favorite periods in time. The drive and spirit of the men, women, and children on the trails headed west just draws me in. Over 400,000 settlers and their families used the trail from 1836 – 1869 when the trip west was made faster and easier by the first transcontinental railroad. Traveling the Oregon Trail is a dangerous journey which can take up to 5 months or more, hundreds of dollars & often meant never again seeing the friends & family you left behind. It is thought that 1 in 4 pioneers died on the trail. But, for those that made it, there were plenty of rewards: a huge sense of accomplishment, free land & a chance to have a better life. The pioneers traveled over 2,000 miles to reach their destination on the west coast of Oregon. Most started from Independence, Missouri although some started further north in what is now Council Bluffs, Iowa. They traveled through present-day Kansas, Nebraska, Wyoming, Idaho and finally Oregon. Once their they received free land and were able to start fresh, far away from the economic depression in the east. The main jumping off point for the Oregon Trail was Independence, Missouri which sits on the western edge of the state, just to the east of the Missouri River. Here is where pioneers would stock up on supplies and prepare for the long journey ahead. Pioneers started their journey by crossing the Missouri River into Kansas. For many, the first stop on their trip was the Shawnee Mission which was a Methodist School for children of the Shawnee Tribe. From the Shawnee Mission, the pioneers traveled northwest through the rolling countryside. The last stop of note in Kansas is Alcove Spring, a beautiful spring surrounded by lush land. Many wrote of wanting to stay in the area but no one began to settle around Alcove Spring until the mid-1850s. For travelers starting in Iowa, Nebraska was the first leg of their journey. They followed the Platte River west across the state. Those coming up from Kansas continued their trek north-west until they reached the Platte River and began to travel in the river valley. Most stayed on the south side of the river. Fort Kearny was located about 200 miles from the Missouri River. It was a crude settlement, built mostly of sod but it was an important stop for the emigrants. There they could rest for a night or two and stock up on supplies. They were also able to send mail from Fort Kearny to family and friends that they had left behind. Two stunning landmarks in Nebraska are Courthouse Rock and it’s companion, Jailhouse Rock. These bluffs fascinated travelers, many of whom had never seen mountains. Some of the emigrants even took detours from the path in order to claim the bluffs and view the landscape from 240 feet above the nearby Pumpkin Creek. One of the last geological wonders that the pioneers encountered in Nebraska was Scotts Bluff, a towering collection of bluffs which rise over 830 feet at their highest point. Fort Laramie, located where the North Platte and Laramie Rivers meet was a very welcome sight for pioneers on the trail. Fort Laramie was originally founded by fur traders in 1834. The U.S. Military purchased the fort in 1849 to help protect the wagon trains traveling west. 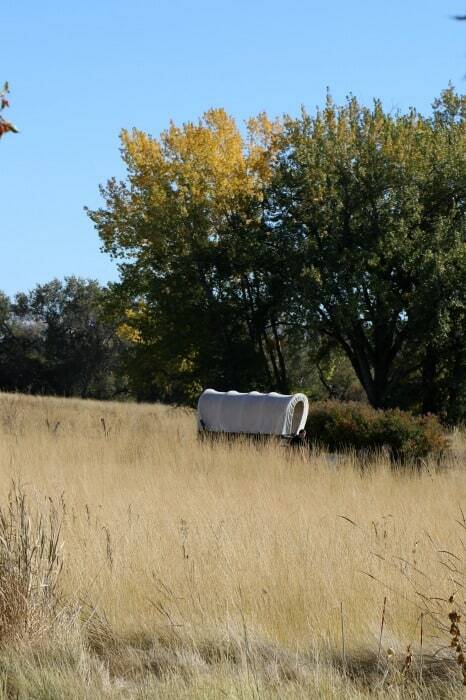 Fort Laramie was also a place where many travelers tried to get rid of some of the goods they had brought with them from the start of their journey. The Rocky Mountains lay ahead of them and extra weight had become a big burden. Devil’s Gate, the next major landmark on the trail could be seen from Independence Rock. The narrow canyon was created by Sweetwater River’s journey through a granite ledge in the area. However, travelers went around the feature which was too narrow for passage. South Pass in Wyoming is a broad valley that separates the Central Rocky Mountains from the Southern Rockies. Without South Pass, the journey to Oregon by wagon would not have been possible for the wagon trains. Pioneers entering present-day Idaho had some difficult obstacles ahead of them. First was Thomas Fork Crossing, which was an incredibly difficult river crossing. Two bridges were built in the 1850s but travelers were charged $1 to use the bridge. Many weren’t able to pay that fee and so they still had to attempt to cross the muddy creek by themselves. Not long after the Thomas Fork Crossing, the emigrants encountered the most difficult part of their journey, Big Hill. It’s exactly what it sounds like, a big hill in the middle of the trail. Going south around the hill was basically impossible due to the swampy nature of Bear River in that area. So, up they went. If the climb up the hill was bad, the descent down it was even worse. The pioneers had to tie ropes to their wagons in an attempt to manually slow them down as they followed the oxen down the hill. After the difficult descent of Big Hill, the pioneers found themselves in the lush river valley of Bear River. This was a welcome place for them to stop and rest. The fresh water and grass also gave them a chance to refresh their animals. Soda Springs was also a popular attraction, the pioneers were fascinated by the naturally hot, bubbling water. Many stopped there to wash clothes. Fort Hall was also nearby. It was a small establishment but gave the Pioneers a chance to trade goods and exchange news. From Fort Hall, the pioneers traveled along the south side of the Snake River. It was a desolate area. Most diaries from this time talk about being frustrated because the Snake River is down a narrow canyon and is not easily accessible. They also complain quite a bit about the mosquitoes which plagued them. Following the river on the north banks, the trail was 130 miles to Old Fort Boise. The wagons had to cross the river again here. This crossing seems to have been less difficult although they all held risks. After passing through Fort Boise, the pioneers traveled northwest crossing the present-day Oregon State border. After months of traveling through prairies and dry plains, the Grande Ronde Valley was a delight to the emigrants looking for rich, unspoiled farmland. Despite the beauty and good farmland here, no one settled in this valley until much later because the land was so unprotected. The Oregon Trail ended abruptly at The Dalles, Oregon. The Pioneers still had about 100 miles before they reached their destination in the Willamette Valley but there was no road through the Cascade Mountains.